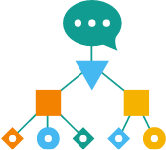 Simplify complex language concepts and parse text with the Linguistic Analysis API. Given a body of text, one of the first steps in analysis is to break it into sentences and tokens. Once your text is split into tokens, you can find the nouns (entities, persons, places, things, etc. ), verbs (actions, changes of state), and more using part-of-speech tagging. Determine the internal structure and meaning of a sentence (entities, purpose, etc.) by breaking it into labeled phrases. This helps you understand who is doing what to whom. Ready to supercharge your app?